Oh Simpsons, you always have a quote to go with every situation. In case you need a refresher – this is from the episode where Lisa decides to become a vegetarian, and Homer is having a big pig roast BBQ. Have you seen it? Do you remember when the pig becomes airborne? “It’s just a little airborne, it’s still good, it’s still good!” Another of my favourite quotes. Homer would not have been impressed with my eats today. I would definitely not win him as a friend. I had grandiose plans of waking up early, getting in something that resembles a workout before it got scorching hot, and then going about my day. But my mom’s cat thought waking me up at 5 am would be a good idea. Which eventually caused me to sleep in way too late – the heat was in the full force, so I squashed the workout idea, and went straight to breakfast. 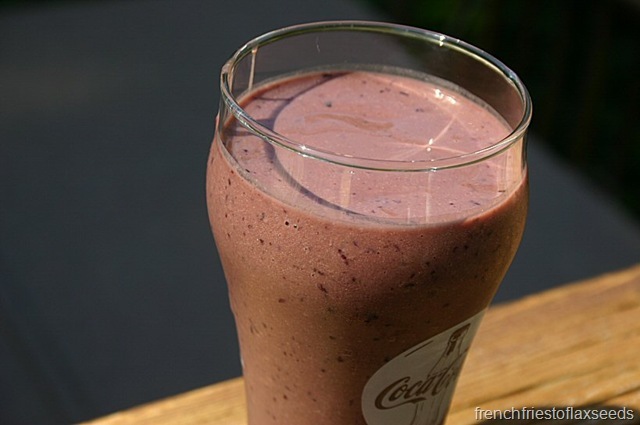 3 ingredients + 1 Magic Bullet = Choco-Cherry Smoothie. This was a cool and creamy glass of delight. 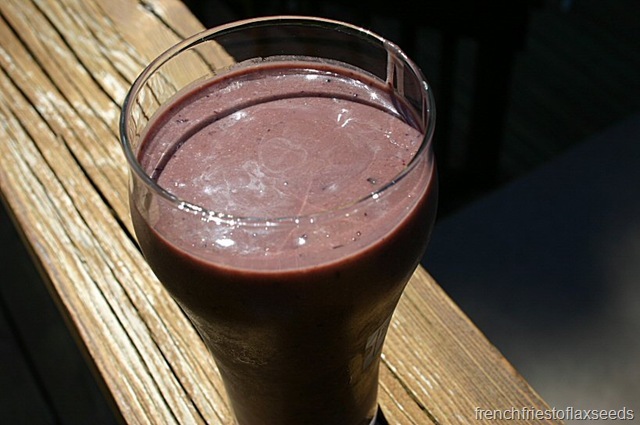 Get yourself some frozen cherries and make a smoothie. 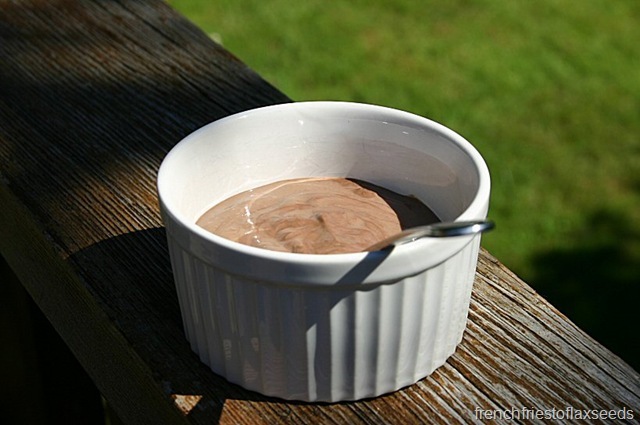 If you can’t find frozen cherries, make your own – that’s what I did! No excuses. Full of smoothie, I got myself showered and ready to head out for the day. I had a foodie blogger date with Jill from Jill’s Test Kitchen. I of course, was late meeting for lunch, as I tried to avoid road construction by taking the back roads, only to get stalled by a damn train. Bah! We met up at Earl’s to sit out on the patio and have lunch. Since it was a balmy 33 degrees C out, I was grateful they had some cabana like tables where we could sit in the shade and not fry – both of us may be on the pale side, and probably wouldn’t have survived out in the sun for too long. 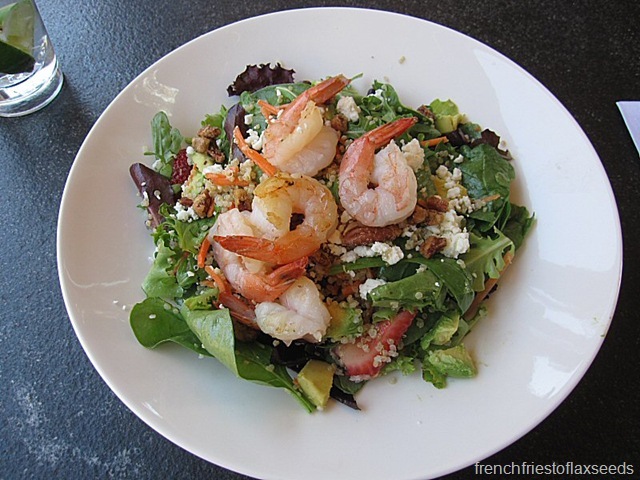 The weather dictated something light for lunch, so I went with the West Coast Prawn Salad – avocado, strawberries, quinoa, feta, organic greens, spinach and cilantro, julienne carrots, candied pecans, citrus honey vinaigrette and warm sautéed prawns. Mine was sans cilantro…obviously. 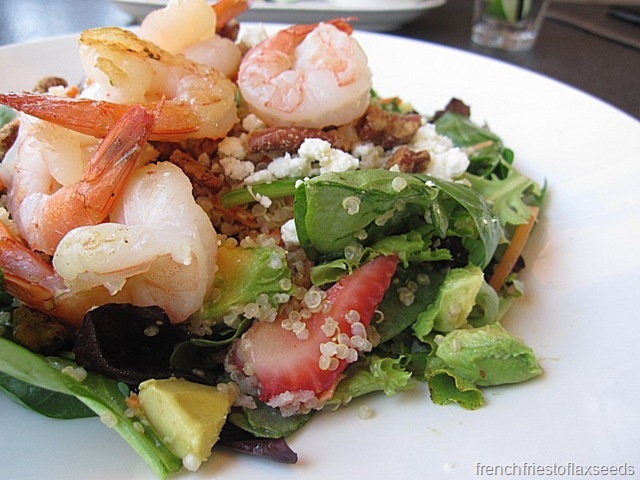 This salad was pretty much everything I love about west coast cuisine, all in one dish. 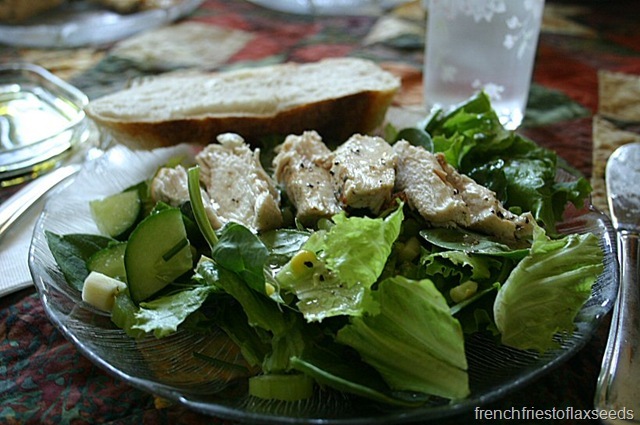 Although there was alot going on, it all played together nicely, and made for a great light lunch on a sweaty summer day. And I have to admit – I was kind of swayed by the inclusion of quinoa. How often do you see that? Now I must recreate the salad so I don’t end up dropping $15 every time I have a craving. After lunch we took a walk through downtown Port Coquitlam, grabbed some Starbucks (iced green tea latte – duh! ), hit up the post office, and made out way over to the Port Coquitlam Farmer’s Market just as they were opening up for the day. We made the rounds, tasted some sample, and filled our reusable shopping bags with treasures. Unfortunately, we also witnessed one of the vendors succumb to the heat – he passed out, and they had to call the ambulance. He was sitting up and looked alright though last I saw, which was good. A reminder too that you need to look after yourself when the temperatures go up – keep hydrated and seek out shade! 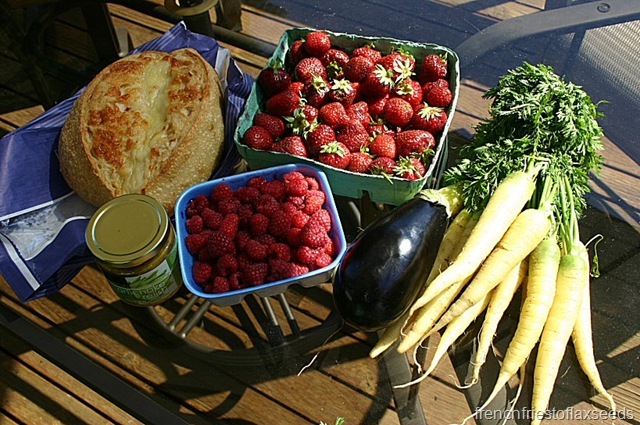 Yes, more local berries. What can I say, I love my berries. Plus the strawberries won’t be around much longer, so gotta enjoy them while they last. I also got some fun white carrots. Simply because they are white. 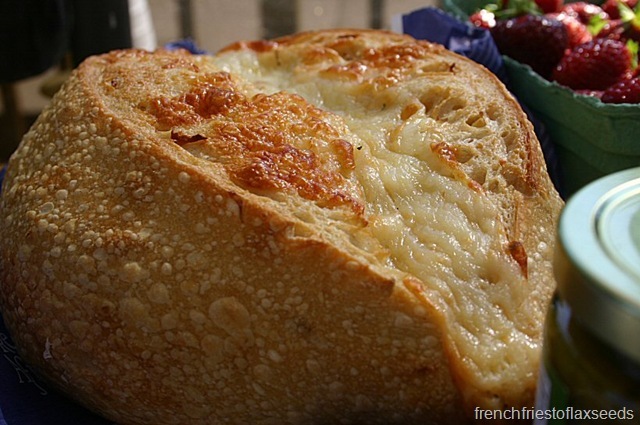 A loaf of cheese & roasted garlic bread from A Bread Affair. I can’t go to the market without buying a loaf of their bread. And a jar of artichoke relish from Glen Valley Artichokes out in Abbotsford, BC. They should have fresh artichokes in August – I may have to pick some up. 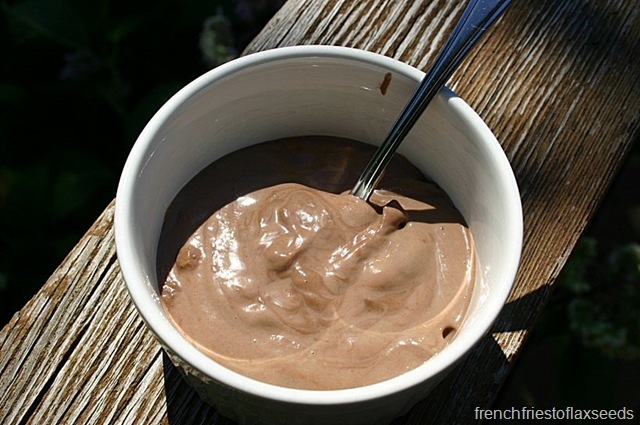 I was looking for a cool snack when I got home, so I dished up some Cocoa Banana Tofudding, straight up. Then it was down the basement to do my best to avoid melting. At some point in time, mom beckoned us for dinner. Enter salad number 2 for the day. 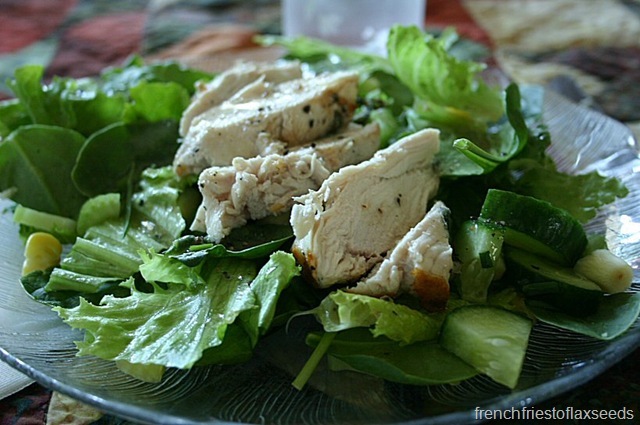 Lettuce, spinach, cucumber, corn, celery, white carrot, chives, and grilled chicken with a vinaigrette dressing. I may have had another slice of bread. Nothing beats a fresh loaf of artisan bread. Once it cooled off a few degrees, I got up the motivation to head out for a walk around the inlet, along with everyone else within a 20 km radius. At least I knew the bears wouldn’t be out on the trail with all the people there! It was still freakin’ hot though – at 8:30 pm, it was only down to 29 C. Ugh. Which was why I needed another cool me off treat when I got back home. 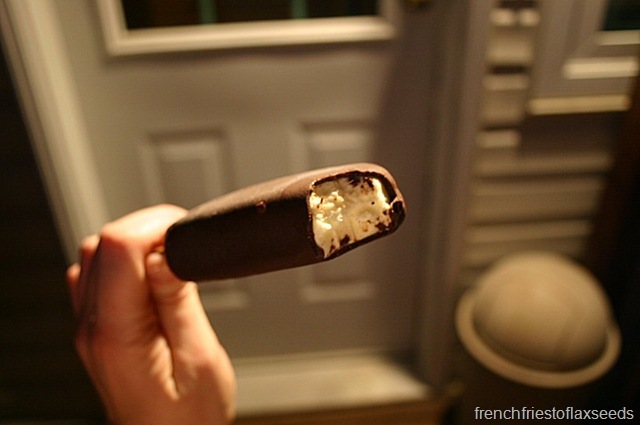 In the form of ice cream on a stick, covered in chocolate. Mmm hmm. Hit the spot. Now that the house has cooled off to a somewhat reasonable temperature, I should attempt that whole sleep thing. Someone has to work in the morning. And has friends from Victoria coming into Vancouver tomorrow who she’ll be meeting for dinner downtown. Night! haha, i’m sure that after the nearly twenty years it’s been on the air, the simspsons really has covered just about everything. that bread looks absolutely fantastic! 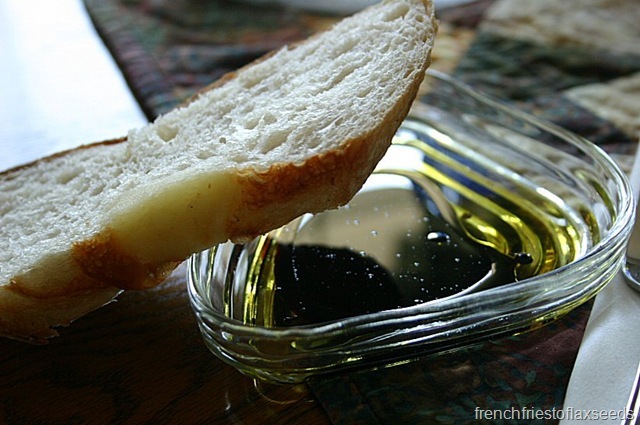 there’s nothing like fresh-baked bread, mmmmmmmmm mmm! what will you do with an artichoke? i’ve never cooked one before. may have to try it in august as well. that bread is fan-fricking-tastic. i’m going to have to go back next week for another one, even if i don’t buy anything else. That bread calls to me. But then again we all know I have a major bread problem! I’m sad to say that the strawberries are already gone in my area. Boo!!! 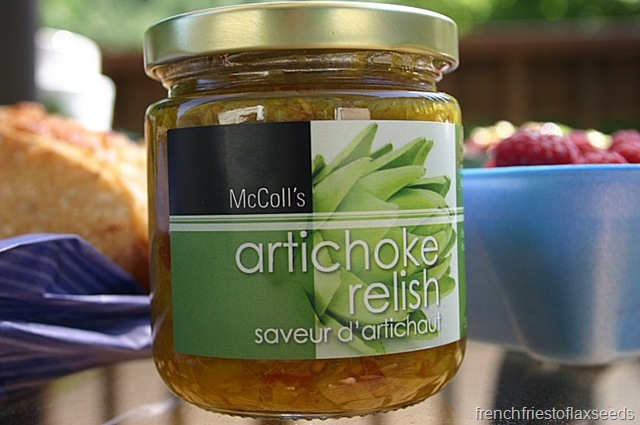 The artichoke relish sounds pretty amazing!! Beautiful produce! I am definitely victim to the “must buy this because it’s a weird color” trap when I am at the farmers’ market. Purple sweet potatoes? Heck yes! Hope work goes well this morning! wow TOFUDDING! haha looks delicious! 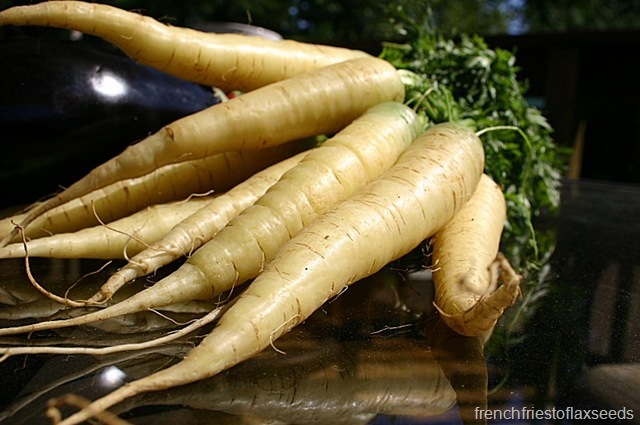 I love white/coloured carrots. I’ve been digging mine for about a week now. I find them sweeter than the orange. Hi, I hope you enjoyed our artichoke relish! We’ve added a few more products and now have a dedicated McColl’s website.